The Jacobsen HR700 rotary mower cuts up to 25 percent more grass than traditional 11-foot rotary mowers, according to the company. 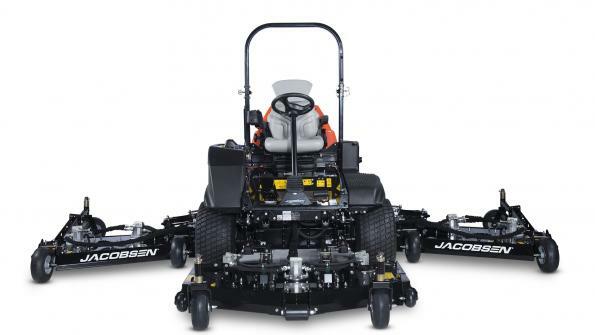 The Jacobsen HR700 is a 14-foot-wide rotary mower. It is a wide-area unit that cuts up to 25 percent more grass than traditional 11-foot rotary mowers, according to the company. The mower combines the maneuverability and agility of a smaller mower with a productive 14-foot cutting width. It allows turf managers of sports fields, parks and green spaces, golf courses, schools, airports and commercial grounds to mow up to 13 acres an hour. The machine is built on a nimble platform. The HR700 delivers a zero-uncut circle and easily maneuvers around obstacles. With a transport width within the front deck, the HR700 mower fits in cramped, tight places. The unit’s SureStrength decks are constructed with high-strength, high-performance steel that delivers durability in a light, sustainable design. Q AMP variable rate steering provides good response to operator input to mow easily around obstacles. An AdaptiCut system automatically adjusts mow speed to ensure consistent cut performance, even through thick grass. Individual hydraulic deck motors with self-lubricating integral bearings deliver cutting power to each blade and require no maintenance. The mower features an iso-mounted operator platform, full suspension seat and cruise control for operator comfort and good productivity.